Clothing and other textiles can be affected by moisture and mold during transport, or become dirty in some other way. It is also possible that textiles feel stiff and uncomfortable, and therefore not suitable for sale, or that they are not colourfast. 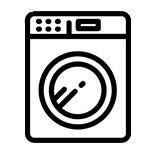 Erren Recondition has industrial washing machines and dryers that remove dirt, stains, excess dyes and unpleasant odours, and to soften fabrics, so that they come into the shop in top condition. With special equipment a finishing can be applied to fix colours and to improve the condition of textiles.